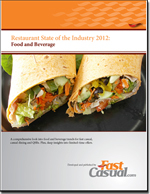 The Restaurant State of the Industry Report 2012 is a benchmark survey designed to track food and beverage, operations, hiring and marketing trends across the restaurant industry. This essential suite of business intelligence is now available as a single bundle, at a great savings over purchasing the three components separately. This 109-page report takes a look at the popularity of practices such as local sourcing, the offering of breakfast, catering platforms and a breakdown of sales based on daypart. It includes the results of a comprehensive industry survey, spanning the casual, fast casual and QSR markets. As an added bonus, the report offers a glimpse of menu-item launches across all three industry categories over the last eight months and highlights which of those items became permanent placements. 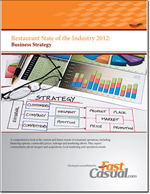 In this second part of our 2012 Restaurant State of the Industry Report, 203 professionals answered questions regarding their business strategy. This report takes a closer look at the specific tactics put into place by restaurant operators to help their businesses run successfully. It explores topics such as financing options, commodity prices, redesign and marketing efforts. 74 pages with more than 250 charts, detailing the results of the exclusive business strategy survey. Expert analysis from Alicia Kelso, editor of QSRweb.com. Insight into local store marketing, current M&A and financing trends, and perspective on operations trends. 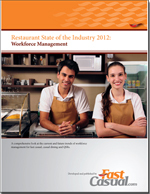 In the third and final part of the Restaurant State of the Industry Report, 206 professionals answered questions regarding their workforce management processes. The latest results pinpoint workforce/management trends, with survey questions answered mostly by smaller operators with one to four units (43 percent). More than three-fourths of those respondents have a solidified list of company culture characteristics. Interestingly, even with the stubborn unemployment rates and array of online job sites available, 44 percent of restaurant brands prefer to recruit internally. Although most businesses don’t feature hourly or salaried recruitment programs, the 25 percent to 35 percent that do target colleges/universities the most, followed by culinary schools.